Most garden centre owners will only ever sell a business once in their lives. The process is likely to be a new experience and one of significant concern. Most will be unaware of the full range of options available – there is rarely a second chance to get it right. ‘What’s the market demand?’ and ‘What’s the business worth?’ Whilst demand may fluctuate, garden centres are long-term investments and values have traditionally held up well. A realisable price will depend on many factors, not just turnover and profit. The ability to maintain existing earnings as well as the potential to improve profitability is a key factor to value. We advise vendors on how to maximise the value of their business. Anyone can sell a business, but achieving the best deal is the challenge. Demand for leases is increasing. We are finding more clients want to retain their freehold, selling the business for a lump sum and granting a lease to the new owners. The viability of a leasehold deal depends on many factors. 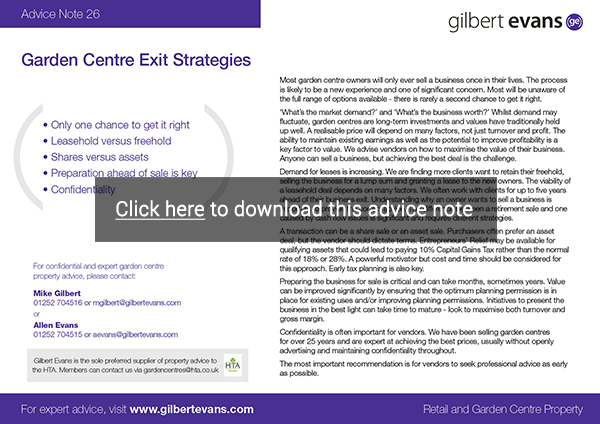 We often work with clients for up to five years ahead of their business exit. Understanding why an owner wants to sell a business is important to provide the correct advice. The difference between a retirement sale and one caused by cash flow issues is significant and requires different strategies. A transaction can be a share sale or an asset sale. Purchasers often prefer an asset deal, but the vendor should dictate terms. Entrepreneurs’ Relief may be available for qualifying assets that could lead to paying 10% Capital Gains Tax rather than the normal rate of 18% or 28%. A powerful motivator but cost and time should be considered for this approach. Early tax planning is also key. Preparing the business for sale is critical and can take months, sometimes years. Value can be improved significantly by ensuring that the optimum planning permission is in place for existing uses and/or improving planning permissions. Initiatives to present the business in the best light can take time to mature – look to maximise both turnover and gross margin. Confidentiality is often important for vendors. We have been selling garden centres for over 25 years and are expert at achieving the best prices, usually without openly advertising and maintaining confidentiality throughout. The most important recommendation is for vendors to seek professional advice as early as possible.